As the Trump administration proposes changes to the North American Free Trade Agreement (NAFTA), Americans have sharply different feelings about the two countries that, along with the U.S., are part of that agreement. 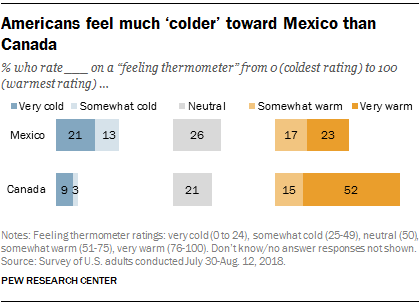 Views of Mexico are mixed: While 39% say they feel “warmly” toward Mexico, 34% feel “coldly,” and 26% are neutral, according to a new Pew Research Center survey conducted July 30 to Aug. 12 among 4,581 adults. The feelings are expressed on a 0-100 “feeling thermometer,” where a rating of 51 or higher is “warm,” a rating below 50 is “cold,” and a rating of 50 is neutral. The public has much warmer feelings toward Canada. Two-thirds (67%) say they feel warmly toward Canada, with 52% giving it a very warm rating (76 or higher on the scale). Just 12% feel coldly toward Canada. There are sizable partisan differences in opinions of both Mexico and Canada. More than half of Democrats and Democratic-leaning independents (55%) say they feel warmly toward Mexico, including about one-third (34%) who say they feel very warmly. A majority of Republicans (53%) have cold feelings toward Mexico, including about a third (32%) who feel very coldly. Only 21% of Republicans report warm feelings toward Mexico, including just 9% who have very warm feelings. There has been a small positive shift in Democrats’ feelings and a small negative shift in Republicans’ feelings toward Mexico since 2016. However, the public’s overall feelings about Mexico have not changed in the last two years (Canada was not included in that survey). In contrast to opinions about Mexico, majorities in both parties give Canada warm ratings, but there is a wide gap in very warm feelings. About six-in-ten Democrats (63%) have very warm feelings toward Canada, compared with 39% of Republicans. A survey last fall found that a majority of Americans (56%) viewed NAFTA favorably, but Democrats were much more positive about the agreement than were Republicans. About half of Republicans (53%) said Mexico benefitted more from NAFTA than did the U.S.; just 16% of Democrats said the same. Note: The topline for this post can be found here (PDF), and the methodology is here.